I woke up this morning and was ecstatic to discover an email from Jeff Dee that included the preliminary sketches for a couple of illustrations he's doing for the upcoming Dwimmermount book. I'll probably share those later, but what immediately struck me upon seeing them was how beautifully he'd captured scenes I'd described in actual play, such as the ascent up the stairs of the Path of Mavors to the first level of the dungeon or the fight with the eldritch bones in the Red Chapel. As a writer, it's really gratifying to see one's words given another form. This in turn got me to thinking about illustrations from published adventures that I found particularly inspiring. The Erol Otus piece on the back of The Keep on the Borderlands has always been a favorite of mine, as has Jim Roslof's fight with the kuo-toa from the combined edition of Descent into the Depths of the Earth. I could cite lots more, but those two have always stuck with me, in large part because they expressed two equally important parts of D&D play: the grand beginning and the nitty gritty of combat against a dangerous foe. So, for today's Open Friday question, I'd like to ask you: what are the illustrations in published adventures that most fire your imagination? The first picture I had in mind when reading your questionwas the fight against the owlbear in KOTB frontpage. / think it wasn't in the english version, only in our french one. I don't know if this counts, but I've always been fond of every illustration in the Dungeoneer's Survival Guide. I also always liked the illustrations in I6 (Ravenloft). Speaking of Jeff Dee, despite liking Trampier's cover of T1 better, I have always found Dee's cover more inspiring. Nicholas, the fight with the owlbear is in all 3 english copies of B2 I own. I'd say most of the player handout illustrations in S1 informed my idea of what the D&D "look and feel" should be, back in the day. I'll second the Dee cover of T1. That illustration fairly EXPLODES with motion. The illustrations that appeared at the base of each page in the First Edition Dungeon Master's Guide's section on random dungeon generation inspired many hours of play for me. I can't point to many specific examples at the moment but without a doubt art, especially interior art, has always helped me visualize the right feel for a given adventure. I used to spend hours making up NPCs based on illustrations. I didn't bother rolling stats or randomly generating anything... I'd tailor them to how they were depicted in the actual illustration. Rahasia, all three: the mass market one and Tracy Hickman's original line drawing that looks like an elegant version of a T&T line sketch and the RPGA limited edition. All three of them are very different, but, rather magically, are equally inspirational individually and as a set. It doesn't hurt that the adventure itself was an early example of a "thinking but not a bunch of puzzles adventure," but also rare in that it isn't as much a "story-driven" one like Pharaoh. The only version I played was the RPGA one which, as I understood at the time (both had been issued by the time we played it - I have no idea how our DM acquired it), is quite a bit different from the mass market one. But it was the cover of the robed lord, unleashing panthers in a corridor that I remember most. The foreground elf maiden with "were-skulls" in her background was, as I recall (probably incorrectly), an unusual shift at the time from other "basic" modules, or maybe it was just the first one of its kind that I had seen. I'll second that. It is so evocative. Who wouldn't want to play in that world after seeing his cover art? The interior illustration of the snake man holding a corroded electric fan says a lot about the game as well. Not an adventure, but one of my favourite fantasy pics of all time. In the TSR version of the AD&D 2nd Edition PHB (I'm not sure which page and don't have the book handy) there's a picture of a female warrior in profile wearing scale mail lying in state. I always try to work similar images into the adventures and scenarios I write. Wasn't that Drelzna from the Lost Caverns?
. . . I never knew she had a name. Google search seems to agree with you though and for that, I thank you. That image has defined the PhB for me for almost two decades. There's that image in the 1st Ed DMG of the skeleton emerging from behind the fighter from the water as he tries to escape the flooding room. Everything about it makes me want to scream "TURN AROUND YOU DOOMED FOOL!" The 'Victory' picture at the end of 1st Ed PHB of the man and dwarf leaving the dungeon. And the ultravision picture from the 1st Ed DMG. I thought it was cool at ten and my opinion hasn't changed. I remember a picture from B2 where a couple of thugs had another guy turned upside down shaking all of his coins out of bags. I remember thinking, "Who wears flip-flops in a dungeon?" The cover of the original Twilight: 2000. It just really captured the feel for the whole game. I love the artwork in the original Rogues Gallery, as well as the drawing of Graz'zt in Monster Manual II. Truth be told, any of the classic, black and white line art provokes nostalgia. 1. Angus McBride's cover for Riders of Rohan. My favorite hands down, for spotlighting such a bleak culture in an amazing freeze-frame. 2. Erol Otus' cover for Castle Amber. Not only did this module give me the most richly rewarding experience ever as a D&D player, the cover image was on my mind all the way through it. 3. David Sutherland's classic of the efreet on the DM's Guide. I know it's not an adventure, but like (2), it fired my imagination in the way that these evil giantish-figures, for whatever reason, did so well. (It also became a favorite for the way it heavily offended a fundamentalist acquaintance of my parents, who was convinced on the basis of this cover alone that D&D was Satanic). 4. Julek Keller's cover for Havens of Gondor. A Tolkienesque sense of haunting loss is so wonderfully realized here it's heartbreaking. 5. I agree that the kuo-toan piece by Jim Roslof is spellbinding, but I'm going to go with a different Roslof piece for my #5 -- Ghost Tower of Inverness, since I remember staring at that cover mesmerized for long periods of time. Cover of the Holmes Basic set, and the Skull Mountain cross section map in the Holmes rule book. I also really like the MM pic of the huge spider lurking above an unknowing party. Pretty much anything Jim Holloway provided illustrations for whether it was his painted covers or his b&w interior pieces for all the old TSR modules. While The Endless Quest book, "Dungeon of Dread" was probably my first recollection of Jim's work, I thought it captured what I envisioned D&D to look like in my head. Seeing subsequent work after DoD just reaffirmed that notion. Prime examples of some of Jim's work that stands out to me were his works from The Sinster Secret of Saltmarsh, The Lost City and Blizzard Pass modules, not to mention his work in MM II. 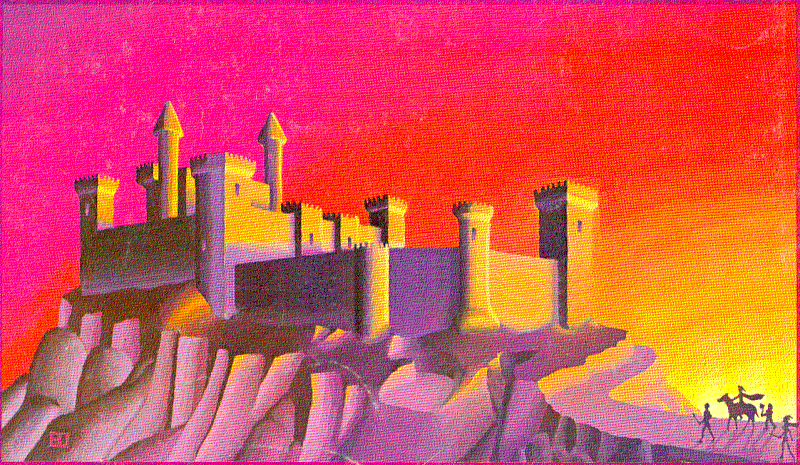 Chateau d'Amberville was the first of only a few modules wherewith the cover art played a major role in my purchase. I'm more of an about-writing guy, art is merely ornamentation, but the cover of Chateau really made me want to do battle with the colossus. Yes, I should have put Holloway's Lost City in my top 5 over Roslof's Ghost Tower, now that I think of it. There's an illustration in the Tunnels & Trolls 5th edition rulebook in the section on Saving Rolls: it has a woman in studded cloth armor walking on a tightrope over a pit of stakes, balancing herself with a short spear while two figures in the background look on. They may or may not be chasing her. There's also a Trampier illustration on the title page of the original Gamma World, a scene viewed from behind, of a crouching figure pointing a ray gun at a silhouetted beast. It looks like he's been caught by surprise while investigating some strange flora on the ground. Both of these strike me as people who've been motivated, by need or by a hunger for exploration, to take the risks they have. That's what "adventure" means to me. And I see I missed the "published adventures" part. D'oh. In that case, I'd have to say it's a toss-up between the "DCS & DAT" cover of module B1 for it's sheer WTF-ery, or the cover of D2: Shrine of the Kuo-Toa--not for its technical accomplishment or the composition, but because you've got adventurers fighting weird fish-men in front of a ziggurat to a creepy lobster-goddess. I loved a lot of the art from Dragon Warriors. It was from the early Fighting Fantasy and White Dwarf school. 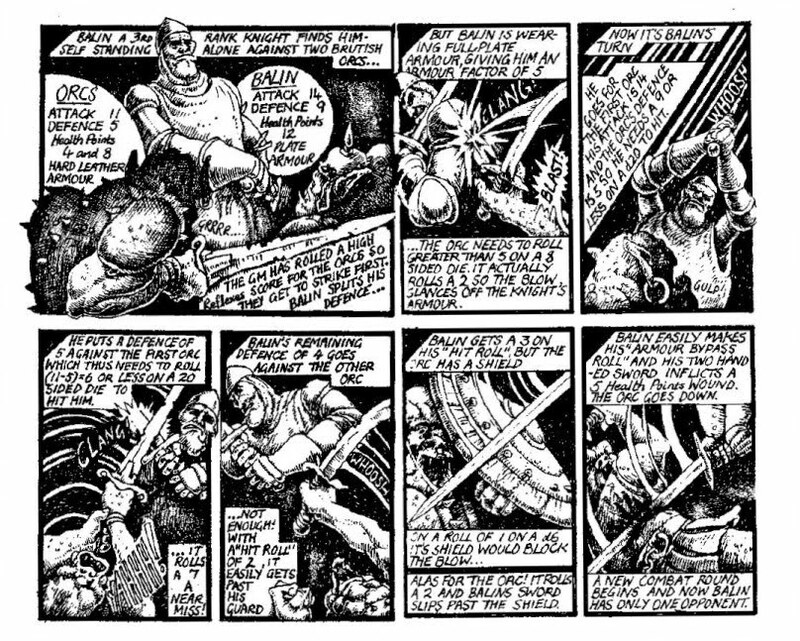 Two pieces I remember (and could fine online) was this Russ Nicholson drawing of three enemy Warlocks and this comic strip that explained the rules of combat. I dunno . . . strangely I've always found a slight disconnect between D&D as I've play it and D&D as it looks in the pictures. The Owlbear fight mentioned above is "almost right" except: why the dressed stonework and flying butresses? And why does it look so well-lit? And what is that oversized halfing doing there instead of my magic-user? Three T&T Solos: Sword for Hire, Arena of Khazan, and Overkill. In D&D the Covers to Keep on the Borderlands, Castle Amber, and the Slave Pits. There's a picture in the last reprint of the AD&D 2e PHB of what is possibly a ranger near a giant monster footprint. The picture is drawn from above with the ranger looking up with a look of fear and trepidation. That sense of foreboding is something I try and infuse my campaigns with, the idea of "Oh Gods, we're going to die." Because sometimes the heroes don't win. Secretly, I try to protect my players from death. I try and give them a slight advantage up until "The Big Game", that is the big nasty encounter that they've been working towards. Then the gloves come off. My players are on their own against the Big Badness. My goal is to get the same reaction from my players as that ranger in the picture has, the "oh shite, we can lose this" feeling. It really screams "AD&D" for me: mistery, danger, dark magicks and ancient secrets. I want my players to be confronted with vistas like that. It's only a little, not-so-much-known piece of art, but I'm pretty sure that it has influenced the aesthetics of my campaings for almost 20 years. Dennis Loubet's work from Swordbearer, particularly the vista scene with the party at the top of a ridge/cliff surveying the landscape below whilst pointing presumably at their destination. I always wanted to build a CGI utility that would create these sorts of vista landscapes from my (or anyone else's) maps, but never got around to doing it. Roslov's color "fight illustrations" are the best: the cover of D1-2 as you stated, but also the front cover of B2 and the back cover of S4 (Barrier Peaks). However, for sheer body of work in one book, nearly all the (non-jokey) illustrations in the DMG have inspired actual campaign/in-game material from me at one point or another. Oh, yeah...Holloway's work throughout the I3-I4 (Desert of Desolation) series is fantastic, and the cover of I5:Tomb of Martek is one of my all-time favorite module covers...though unfortunately, I don't know who gets the credit for that last illo. @JB - The cover of I5 was done by Jim as well. Thanks! Yeah, Holloway had some great stuff in the post-1983 days of TSR. I think a lot of my "mind's eye" picture of D&D comes from his illustrations. I, too, read quite a few "Endless Quest" books with his illos as a kid. I could name lots, but for me, it starts with the cover to my Holmes D&D set. Not from a published adventure, but from the 1st Edition Players Handbook. It’s that picture of a bunch of dwarves and a halfling(presumably), turning a corner with a Magic Mouth speaking. They are walking by torchlight. They are heading around and down a staircase that at the bottom of which lurks something with glowing eyes. You can barely see the eyes and I missed them for many years. Likewise, the illustration in the 1st Edition MM, of the adventurers plugging their way through strands of spider web, with a large monstrous spider waiting, is another that captures, for me at least, the ultimate feel of what the game is all about. I like the Hackmaster covers on their rulebooks and "rehacked" modules, inspired by the iconic covers of 1e products. They depict the bloody prelude to the scene on Tramp's PH cover, the grisly aftermath of the image on Sutherland's DMG cover, the unfortunate sequel to the mining tunnel battle against the aspis in "Smackdown the Slavers." They're hilarious, and for me, humor has always been a big part of the game. I just adore Stephan Fabian black and white illustrations in the Ravenloft sourcebooks for 2e AD&D. The cover piece by Otus for "Hidden Shrine of Tamoachan "and "In Search of the Unknown"( did Sutherland do the second one?). I also quite like the cover for Arduin Dungeon II: The Howling Tower. That one really sets the tone that the party is entering one serious mega dungeon. While I loved Jim Roslof, Jeff Holloway and Larry Elmore, I was always intrigued by Jeremy Goodwin's artwork for the one-on-one Expert D&D module O2: Blade of Vengeance. The cover's not particularly good, but the interior illustrations are pretty fantastic, in that stereotypical 80s British style that I fell in love with through the Lone Wolf books and Warhammer and Talisman ads. B10: Night's Dark Shadow, has somewhat similar interior art, and great maps (as well as being a great epic adventure). Outside of D&D, I was always impressed by the advertisements in Dragon Magazine for the 1st Edition MERP Middle-earth Adventure Guidebook and Bree and the Barrow Downs supplements; I think they were by the same artist - both featured scenes devoid of any characters (one of an arched stone bridge over a river valley; the other of the town of Bree as seen from a high bluff), by the light of a full moon. They always struck me as very romantic and haunting and lovely and suggestive of mystery - something I always wanted to try to evoke somehow in my fantasy games, and what I definitely wanted in a MERP game. Thought of one more - One Hundred Bushels of Rye, for HarnMaster. It's a simple picture - a bushel of rye with blood dripping out the bottom. I never actually got to read the adventure, but the simple, stark and mysterious cover image always made me wonder about it. Well, sort of. They were frames from the atrocious 1978 animated film (like the cover of the Moria module). I know Elmore isn't everyone's cup of tea but that image is just perfect as far as I'm concerned. Honorable mention to the 1e Player's cover with the party around the big fat idol. Keith Parkinson's cover for the Advanced Dungeons & Dragons Player Character Record Sheets (green cover) has haunted me for ages. Also, Mr Parkinson's cover for the Basic D&D Player Character Record Sheets (lavender cover) - a close second.